Turn Up The Quiet with Diana Krall! With her pre-bop piano style, cool and sensual singing, and gorgeously photogenic looks, Krall took the jazz world by storm in the late 1990s with the release of her first studio album, Stepping Out, in 1993. Her third album, All for You: A Dedication to the Nat King Cole Trio (1996), helped show off her singer-pianist roots and earned her a Grammy nomination and several prime Billboard positions, cementing her name as one of top popular Jazz artists around. 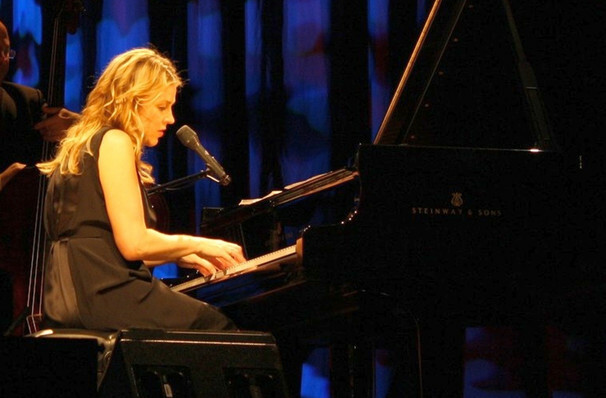 Born into a musical family, Diana Krall began learning to play the piano at the tender age of four and performed with a jazz group during her High School years, as well as performing solo at local restaurants. Her perseverance paid off - upon graduating high school, she was awarded a Scholarship to study music at the esteemed Berklee College of Music. Her time there was beneficial in more ways than one, for it was only some encouragement from one of her music teachers that she began taking her singing more seriously! Today, Diana balances her music career with her family life - she is married to British musician Elvis Costello and the couple have twin boys. Sound good to you? Share this page on social media and let your friends know about Diana Krall at Humphreys Concerts by the Beach. Please note: The term Humphreys Concerts by the Beach and/or Diana Krall as well as all associated graphics, logos, and/or other trademarks, tradenames or copyrights are the property of the Humphreys Concerts by the Beach and/or Diana Krall and are used herein for factual descriptive purposes only. We are in no way associated with or authorized by the Humphreys Concerts by the Beach and/or Diana Krall and neither that entity nor any of its affiliates have licensed or endorsed us to sell tickets, goods and or services in conjunction with their events.